Now this is a stunning piece one doesn't find every day! 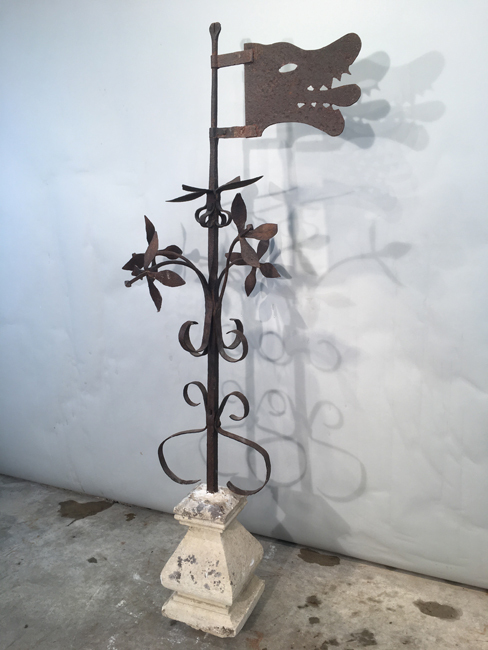 it features a swiveling 18th C hand-wrought iron wolf's head weathervane without directionals and a stem decorated with all hand-wrought iron flowers, mounted in a limestone base. Perfect as a decorative item outside or in, it would make a lovely and unusual focal point in a small herb or kitchen garden or centered in a clipped boxwood knot garden. If you will be using it outdoors in cold climates, please install the limestone base on a piece of stone or a concrete footing to prevent moisture wicking and subsequent cracking.